Opened in 1928, the historic theater was designed by John Eberson, and was once the largest theater in Flint. Under the design guidance of DLR Group|Westlake Reed Leskosky, renovations of the building will be completed by the end of 2017 or the beginning of 2018. By this time next year, Flint, Michigan’s, Capitol Theatre will once again host live performances. Opened in 1928, the historic theater was designed by John Eberson, and was once the largest theater in Flint. Under the design guidance of DLR Group|Westlake Reed Leskosky, renovations of the building will be completed by the end of 2017 or the beginning of 2018. The Whiting, another theater in Flint, and the not-for-profit Uptown Reinvestment Corporation are spearheading the project. 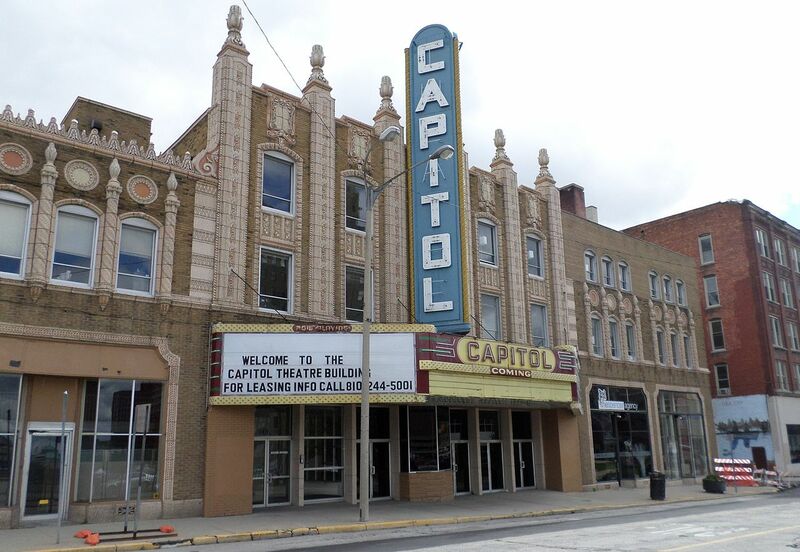 “The Capitol Theatre was once the community’s living room so-to-speak, where residents gathered for shared cultural experiences and live entertainment,” said Jarret M. Haynes, Executive Director of The Whiting. “The Capitol’s re-opening will deepen the impact of our vibrant arts community and become a resource to foster creativity right here in Flint. We are so proud to bring this treasure back to the city and look forward to welcoming visitors from the city and region for generations to come.” The Capitol Theatre was added to the National Registry of Historic Places in 1985, but it has laid vacant since 1996. Starting in 1970s the 1,600-seat theater played host to many popular acts, including Ray Charles, AC/DC, John Mellencamp, Green Day, and Black Sabbath. The experience of the theater was so designed to evoke the idea of sitting in an outdoor amphitheater. The restoration will bring back many of the theater’s original details while updating its technology. Restorations will be extensive, on the interior and exterior of the building. The original 1928 facade will be fully restored with its intricate terracotta ornament. The ceiling of the auditorium will be restored to its sky-like appearance, to include lighting special effects that mimic the transition of day and night. Decorative plasterwork and statuary throughout the building will also be brought back to its former glory. A new marquee and sign are already visible on the building, which started restorations in mid-2016. While the theater may be brought back to its original aesthetics, its new technology will be state-of-the-art. While the theater seats will be replicas of the originals, the sound, acoustics, lighting, backstage, and front-of-house will all be updated. Along with updating the performance space, 25,000 square feet of office and retail space will be reopened in the building. When completed, it is hoped that the theater will host about 100 events a year, attracting more than 60,000 guests annually. This article appears on HoverPin, a new app that lets you build personalized maps of geo-related online content based on your interests: architecture, food, culture, fitness, and more. Never miss The Architect’s Newspaper’s coverage of your area and discover new, exciting projects wherever you go! See our HoverPin layer here and download the app from the Apple Store. Artists in Flint, Michigan are used to morbid analogies, but Spencer’s Art House is literally using a funeral home to “demonstrate Flint’s potential for rebirth.” The project turned a 120-year-old mortuary in Flint’s historic Carriage Town neighborhood into an alternative space for artists, designers, and engineers. It’s a gut rehab and then some, but the project has attracted the full force of Flint’s artistic community. Vacant 15 years, the space has hosted concerts, puppet shows, community meetings, and other events since various artists and student groups began to fix it up. Flint’s Public Art Project passed along the news that the team launched a successful Kickstarter campaign, raising $12,000. Their project uses only recycled materials, reclaimed from construction dumpsters, occasional donations, and to-be demolished houses around the city. In addition to clearing debris in Spencer’s House, the team has added weatherproof siding, rainwater harvesting systems, and an outdoor amphitheater. Last week, we reported on a new, rather unprecedented plan by new-ish Detroit Mayor Dave Bing to condense the city to fit its current population, which is half what it was six decades ago. 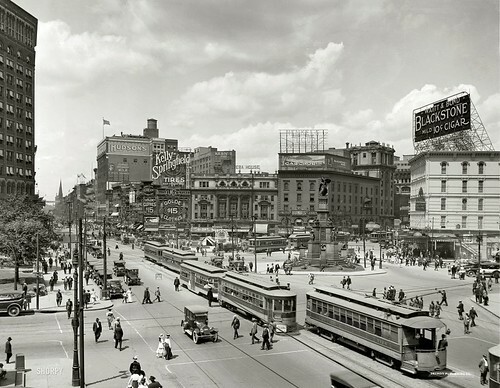 Among the people we interviewed was local AIA President Raymond Cekauskas, a huge Detroit booster who sent along the picture above, a reminder of the city's "grand past," as Cekauskas put it. But it is also a fitting image of what the city could very well become under Bing's plan, still in its chrysalis—a little smaller, tightly knit, transit-oriented (yes, transit is coming to the Motor City), in a word, homey, which we mean in a good way. Just look at all the gorgeous homes wanting for salvation. Meanwhile, a Tufts professor looks to Flint and Youngstown for similar shrinking models, though by no means on the same scale. Welcome to the Brave New Midwest.